Happy Spring! As we welcome the change in seasons, we also welcome the many families and individuals seeking a new place to call home. If you have a home or property on the market, now is an excellent time to prepare for all the Summer excitement. Here at Huneycutt Realtors, we are eager to assist you in the process of preparing and selling your home, in any way that we can. 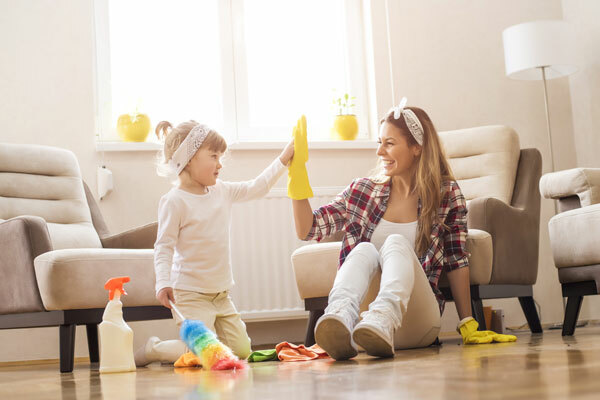 In addition to the many other tools we have available on our site, we’ve created our Spring Cleaning Tips for Sellers. These tips are sure to attract homebuyers and will save you time and money in the long run. If you have any questions, contact one of our Clarksville Tennessee realtors right away! Perhaps the most important part of selling your home, is selling the outside of your home. You may have the most immaculate home on the block, but if there are trash cans overflowing, and tall weeds growing all over the yard, you’ll surely scare your buyers away before they can even make it past the front door. Your property’s outdoor appeal can often dictate a potential home buyers decision. In order to attract buyers, make sure your property is in tip-top shape. These little touches will attract not only attract homebuyers but locals in the area, that can help to spread the word around. “Hey did you see that beautiful home for sale down the street?”. Make sure to clean your windows, inside and out! Brighten up the room with new curtains/blinds. Make sure to clean your windows, inside and out! Brighten up the room with new curtains/blinds. Extra credit tip: replace heavy drapes with lightweight lightly colored shears, this will help brighten your space even further! If a buyer is touring your home and they come across a strong odor, they will take off running. Make sure your home is smelling fresh, clean, and comfortable. Clean out the Refrigerator, and check for standing water in the drip tray. Expert Tip: Remove any odors in your fridge by scrubbing with baking soda and water solution. To keep your fridge smelling fresh dip a cotton ball in vanilla extract or orange juice and place on the shelf before your guests/buyers arrive. Clean the Dishwasher - Boil Lemon Juice and add it to your dishwasher to get rid of any built up smells. Put lemon rinds down the drain for a fresh clean scent. If there are any cobwebs in the corners or build up dust from over the years, that is another variable that will send buyers for the hills. Make sure to deep clean your home, and prepare for new residency. You want to make your home look “new again” or as close to it as possible. Grease, smoke, and dust can adhere to the walls, making even the most immaculate decorations look dismal. Be sure to take care of these things before showing your home to potential buyers or working with realtors in Clarksville, TN. Address everything within your home that you can before you dive into the home selling process. Stage your home appropriately for whatever type of buyer you are trying to appeal to. If you have a family home and are trying to attract a reliable family to live in it set the stage accordingly. Set up a playroom for children with actual toys in it, and beds that are made. Have a tray of cookies and crackers ready for buyers that are touring your home. Think about your audience and try to appeal to whatever demographic you think you will have the most success with. If you need any assistance in staging your home contact a Clarksville Realtor, we are familiar with how to properly stage a home and are happy to help. Questions or comments? Contact us right away! You can call the office at 931-552-7070 or toll-free at 866-517-7070. If you’re interested in seeing how others have staged their home, take a look at our latest listings. For more information visit our Facebook page!